The International Journal of Medical Informatics recently published the results of a user experience analysis that SIAPS led on e-TB Manager, a digital health tool used to manage TB patients. Using quantitative methods, SIAPS staff analyzed user experiences in nine diverse country health systems that cumulatively bear nearly one-third of the world’s TB burden. 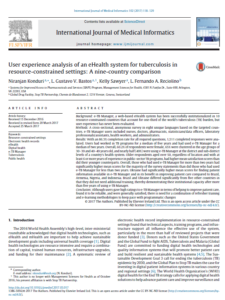 The study compared the user experience among individual countries by age, location, and years of experience using e-TB Manager and working in a national TB control program. The report showed a number of positive results. 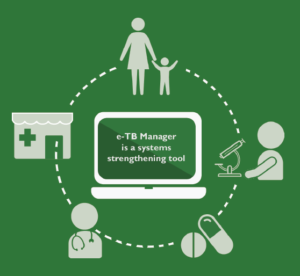 The findings demonstrate that users across diverse country health systems find e-TB Manager reliable for case management and confirm that it improves patient care and productivity in the workplace. This supports the health information priority objective in USAID’s 2015–2019 Vision for Health Systems Strengthening. The study also showed that countries that had used e-TB Manager for more than two years had significantly higher scores than those that had used the digital tool for two years or less. Another takeaway: after more than five years and with SIAPS support, both Brazil and Ukraine built their institutional capacity to manage e-TB Manager. Both country health systems demonstrated resiliency by adapting to in-country political changes and adopting periodic TB programmatic updates. The user experience analysis will help inform international agencies, national authorities, and donors on future directions of national TB control programs and specifically on the use of e-TB Manager as a digital health application for WHO’s End TB strategy. SIAPS principal technical advisor Niranjan Konduri led the multicountry study, which was co-authored by SIAPS technical advisor Kelly Sawyer and others. Read more in the Lancet Global Health blog and find the open access article here. Source: Konduri, Niranjan, L. Gustavo V. Bastos, Kelly Sawyer, and L. Fernando A. Reciolino. “User experience analysis of an eHealth system for tuberculosis in resource-constrained settings: A nine-country comparison.” International Journal of Medical Informatics 102 (2017): 118-29. ← SIAPS Voices Q&A: Can we vanquish malaria for good?